A computing environment that comprises both a private and a public cloud for sharing the data and applications to perform different functions is called as hybrid cloud. A user always looks for certain efficiencies at different levels in cloud computing services but public cloud services are possibly more cost efficient and scalable in comparison to private clouds. In case of hybrid cloud, the efficiencies can be maximized by implementing public cloud services for all the non-critical operations and rely on private cloud for the critical operations ensuring that the integration on all platforms is seamless. A team of separate cloud providers gets formed for offering both the public and private cloud services as an integrated service. A complete hybrid package is offered by individual cloud providers. Enterprises those themselves manage their private clouds sign up to a public cloud service and then integrate it into their infrastructure. Practically, enterprise may implement hybrid cloud for hosting its e-commerce website within a private cloud which offers security and scalability to more extent but keep their brochure site in a public cloud which is highly cost effective (while security is less concerned). IaaS can be an alternative as it might follow the hybrid cloud model and offer an economic business with storage for client data within a private cloud but allow the collaboration on project planning documents in the public cloud which is accessible to several users from a convenient location. In a private cloud, scalability is offered to some extent as it depends on its configuration (whether it is internally or externally hosted) while in a public cloud scalability has fewer boundaries as the resource is dragged from the larger cloud infrastructure. Moving maximum non-sensitive functions to the public cloud enables the organization to reap the benefits of scalability and also reduces the demands on a private cloud. Once more, public cloud offers scalability which leads to greater cost efficiency as compared to private clouds. With hybrid clouds organizations can gain benefits for all possible business functions while securing sensitive operations. 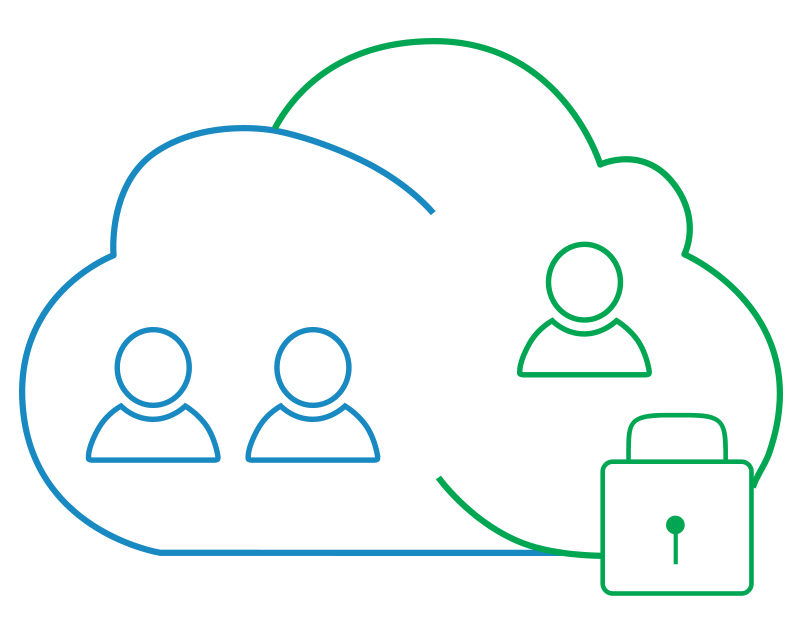 The hybrid cloud model’s private cloud element provides security where required for sensitive operations as well as satisfies the rigid essentials for handling data and storage where it is important. When both secure resource and scalable cost effective public resource are available, organizations can get more opportunities for exploring different operational avenues. Though the private cloud and public cloud offer compelling benefits for certain use cases, sometimes organizations need combined benefits of both. This is only possible with hybrid clouds. Let’s check where hybrid clouds can be used. Application success isn’t always ensured to a particular degree in the market. Businesses that use cloud follow the tagline, "fail fast, fail cheaply”. This indicates that it is sensible to use the public cloud resources for a new and untested application prior to deciding on the capital associated with its launch in the private cloud. Once the organization gets in practice of managing the workload and gets a clear picture of application stability, it may think of launching the application in the private cloud. Enterprises would require high capital for building highly available and geo-redundant setup for a private cloud. This is because it requires double expenses than a single private cloud does along with a data center located geo-dispersed from the primary one. Several organizations can’t spend such high but not having a geo-redundant private cloud configuration might lead to catastrophic event vulnerabilities. Hybrid clouds are the best options that offer high availability (HA) and disaster recovery (DR). For example, if the organization wants to recover the data after a disaster, it can keep the production environment in private cloud while a recovery environment in public cloud, ready to drive when required. The data is replicated across to the public cloud by the organization but the other resources stay in non- operational mode until they are needed. When a disaster strikes, administrators can quickly start the application in the public cloud which results in saving expenses and improve application availability dramatically. The benefits of hybrid cloud for achieve data are similar to that of disaster recovery and therefore, DR and archive hybrid cloud are done simultaneously. Some people believe that cloud is cheaper as compared to on-premise data center which isn’t essentially true. Putting data at rest in a hybrid cloud for long time is really cheap and so, if the data at rest isn’t moved in and out, it might be very cost effective.